With more and more landlords taking advantage of free and low cost advertising such as Craigslist and other online options, many tenants and landlords establish their relationship online and continue to communicate by e-mail. Banks do it, utility companies and management companies do it, and you can too! You don't need a complicated program to be able to send your tenants a simple e-mail reminder notice. You can simply copy and paste these Heads Up! E-Mail Notices and Reminders into your e-mails and send them as needed. You can easily customize the existing notices for your tenants and even create new ones for other situations. The fact is, e-mail reminder notices are effective. In today's society it is often easier and faster to reach someone by e-mail than by phone or postal mail. The simple reminder of a payment coming due or other obligation can sometimes make all the difference. "I never intended to communicate with my tenants by email, but they have my email address from my online rental ad." The Heads Up! 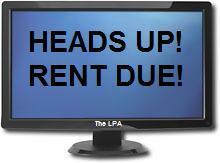 E-Mail Notices and Reminders are an exclusive Free Bonus for LPA Members. Don't Want Tenants Emailing You? Now more than before, courts are accepting printed out emails as proof of official notices, repair requests and other paper trails by tenants to be used against landlords. The LPA does not recommend email communication as a medium for any official notices regarding the tenancy from tenants. For your protection, insert the notice below to appear at the bottom of any emails you send to your tenant. DISCLAIMER: This email address is used primarily for advertising purposes. If you have business with our company, please note that all official notices or requests should be sent to us directly in writing by First Class mail or certified mail. We do not guarantee a timely response to any email messages. Just copy and paste the above to the bottom of your emails when corresponding with tenants online.